I started out producing the big corporate bags and it was a big hit. People requested for a smaller version so I produced the mini. The mini was a hit for the ladies, but the gents are still looking for a perfect sized corporate bag for their everyday use. So the Medium Corporate bag was born. 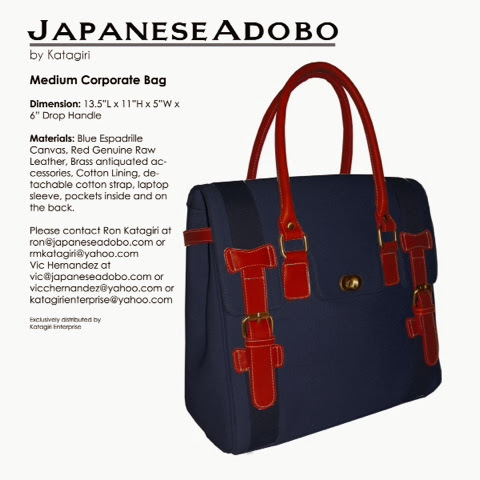 A bag that is androgenous and versatile enough to serve its full functionality and style. 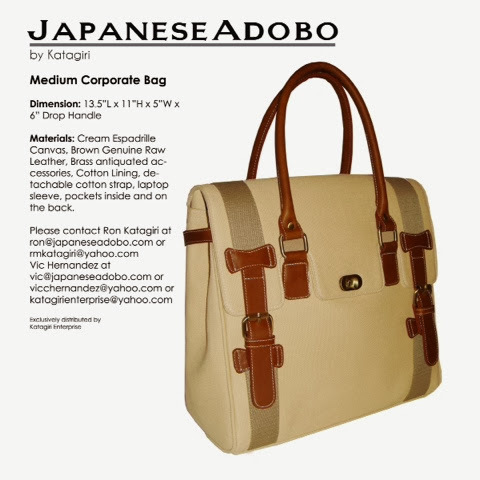 With the same aesthetics, the JapaneseAdobo Medium corporate bag transcends from formal to casual ensemble; with its espadrille cotton canvas highlighted with genuine cowhide leather and detachable straps, notebook sleeves and pockets inside and out, the bag is a sure hit for both men and women. I am proud to have made the new collection with Filipino manufacturers in mind. This is a symbol of the Filipino artistry at its finest. The details, craftsmanship and quality is my pride that we Filipinos can compete with international brands worldwide.